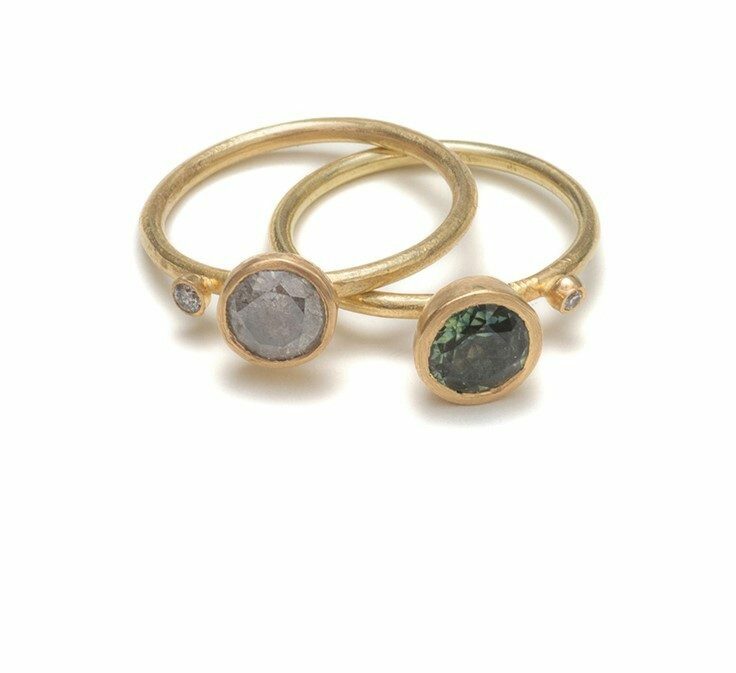 These rings are from my bespoke wedding range, a collection of precious and engagement rings, some incorporating elements of my stacking rings, using stones in a variety of rich beautiful colours, particularly grey’s and greens. 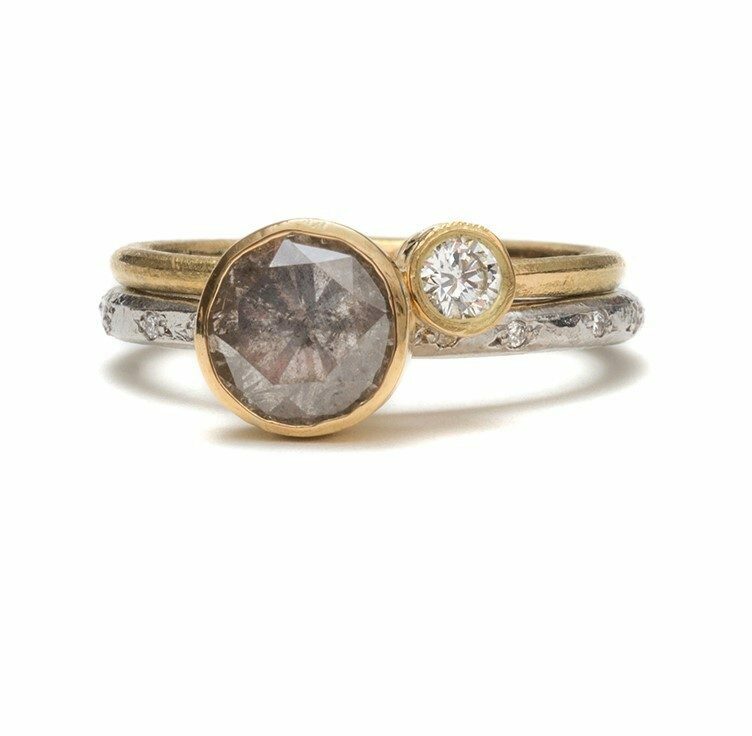 This beautiful set, created from textured and hand formed 18ct yellow gold, has a lovely claw set grey spinel and collet set round brilliant cut diamond, a further 15 diamonds are scattered around the larger band for added sparkle. 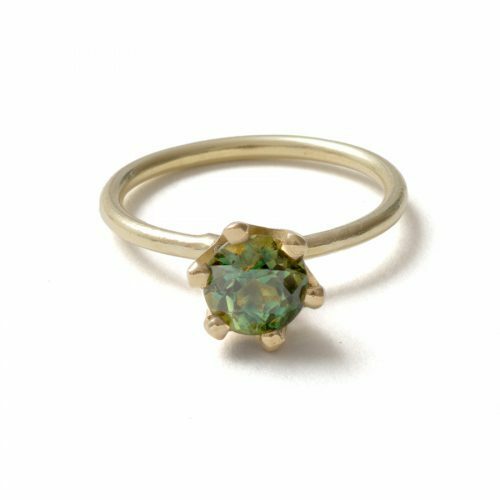 This ring is from my bespoke wedding range, a collection of precious and engagement rings, some incorporating elements of my stacking rings, using stones in a variety of rich beautiful colours, particularly grey’s and greens. 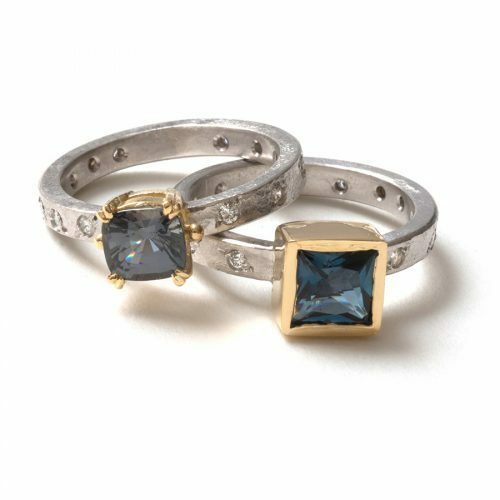 This beautiful set, created from textured and hand formed 18ct white and yellow gold, consists of a stunning teal sapphire, and a warm champagne diamond claw set in beautiful intricate settings. 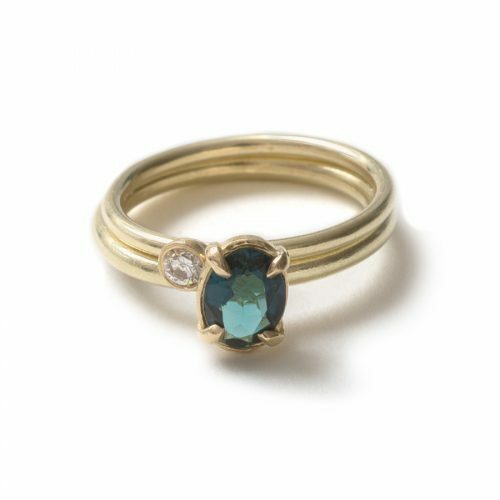 18ct gold white and yellow gold, 7.2mm teal sapphire, 4mm champagne diamond, 0.30ct. 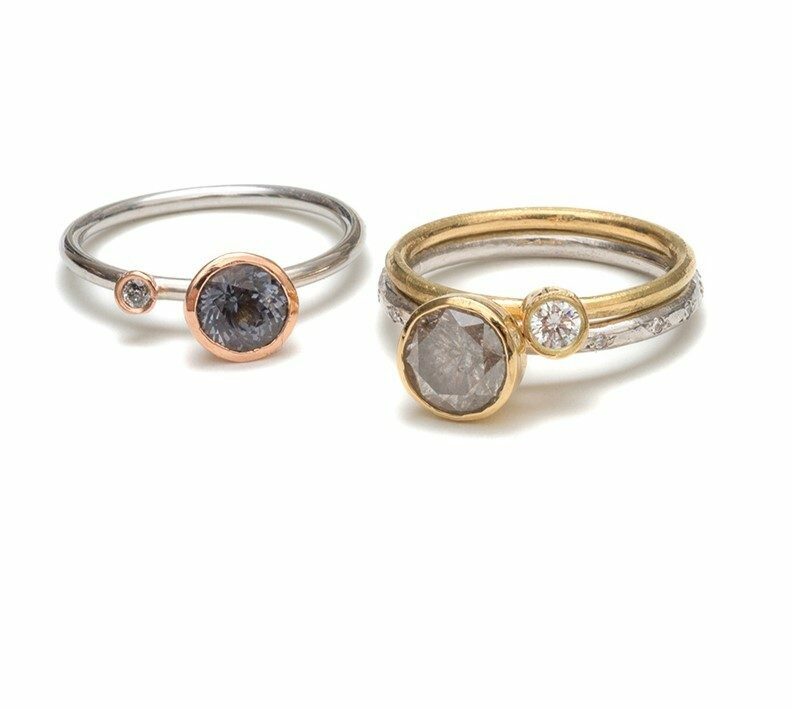 2mm and 1.5mm 18ct gold bands. 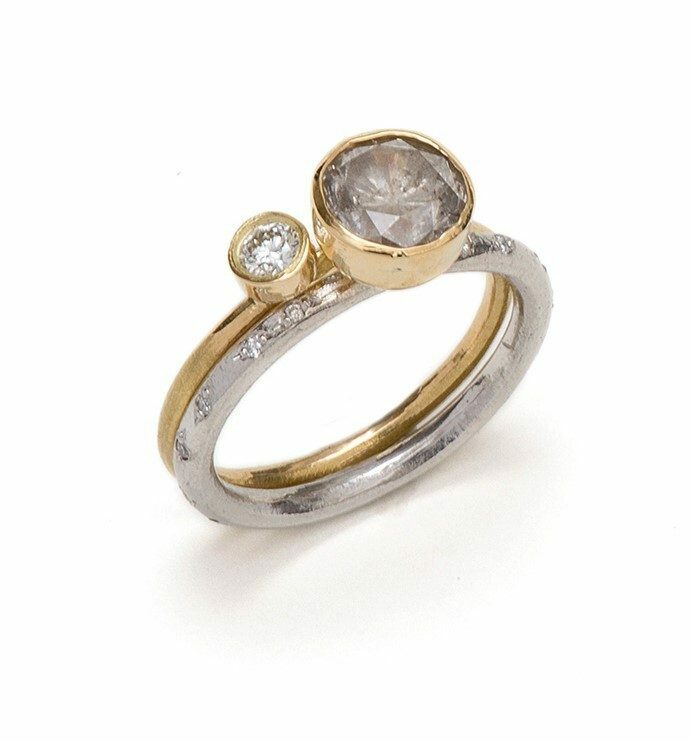 This beautiful set, created from textured and hand formed 18ct white and yellow gold, consists of a stunning round brilliant cut salt and pepper diamond, and white round brilliant cut diamond set in a warm yellow gold collet settings, with 12 round brilliant cut diamonds scattered around the band to add sparkle. 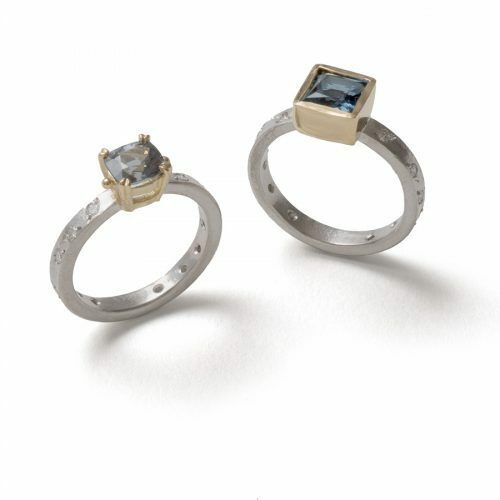 18ct gold white and yellow gold, 6.2mm salt and pepper diamond, 1.52ct, 12 1mm diamonds, .06ct 3.4mm diamond, 0.17ct. 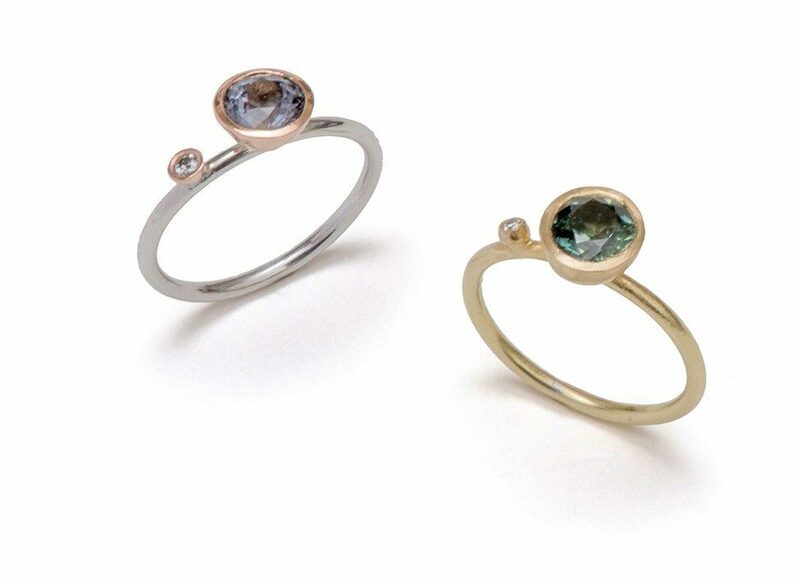 2mm and 1.5mm 18ct gold bands, 7mm setting. 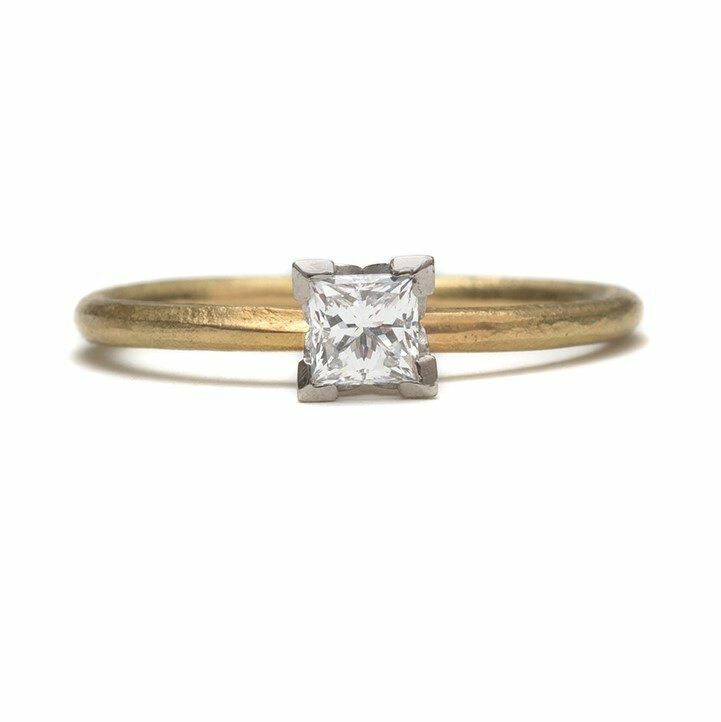 This beautiful ring, created from textured and hand formed 18ct yellow gold, has a lovely claw set princess cut diamond, in 18ct white gold, a beautiful contrast. 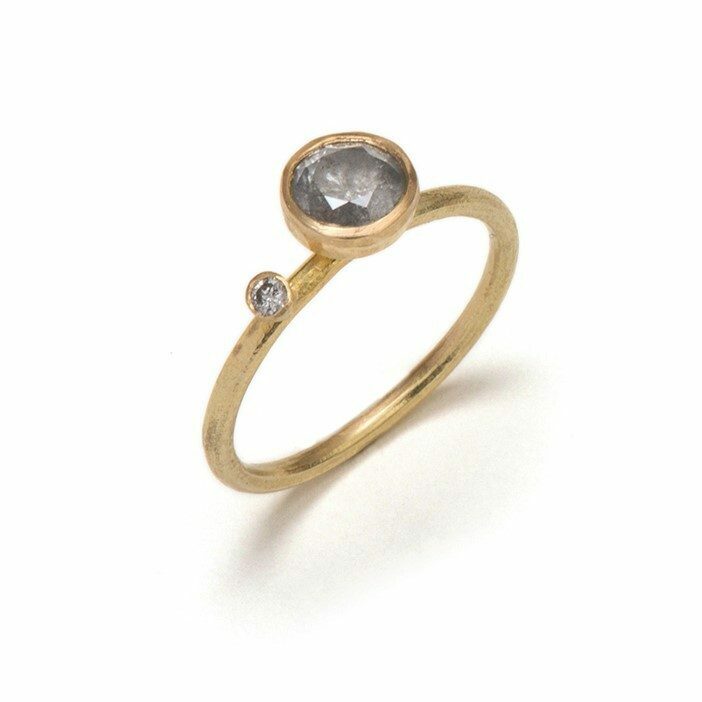 18ct yellow gold, 3.5 mm diamond, 0.29ct diamond. 1.5mm band, 4mm high settings. 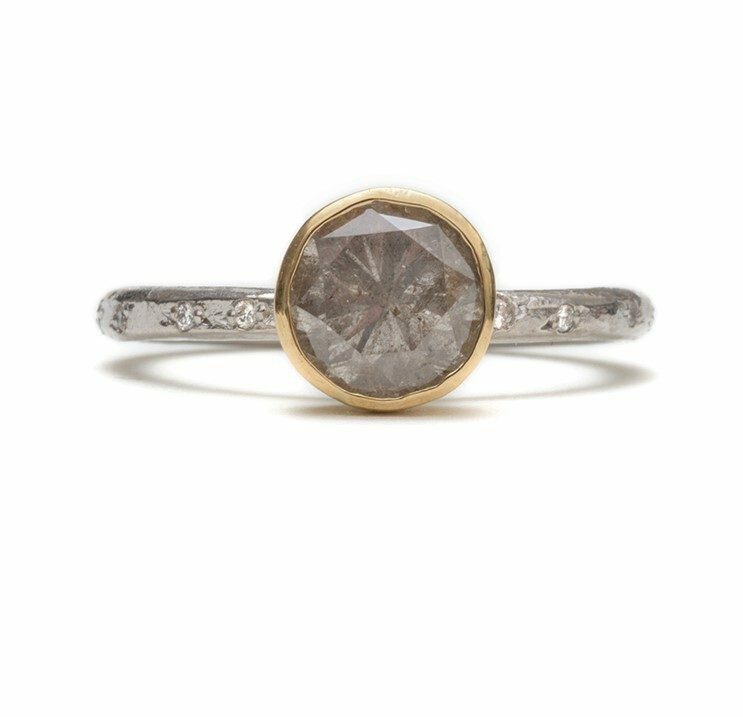 This beautiful ring, created from textured and hand formed 18ct yellow gold, has a lovely collect set grey diamond, and small round brilliant cut diamond. 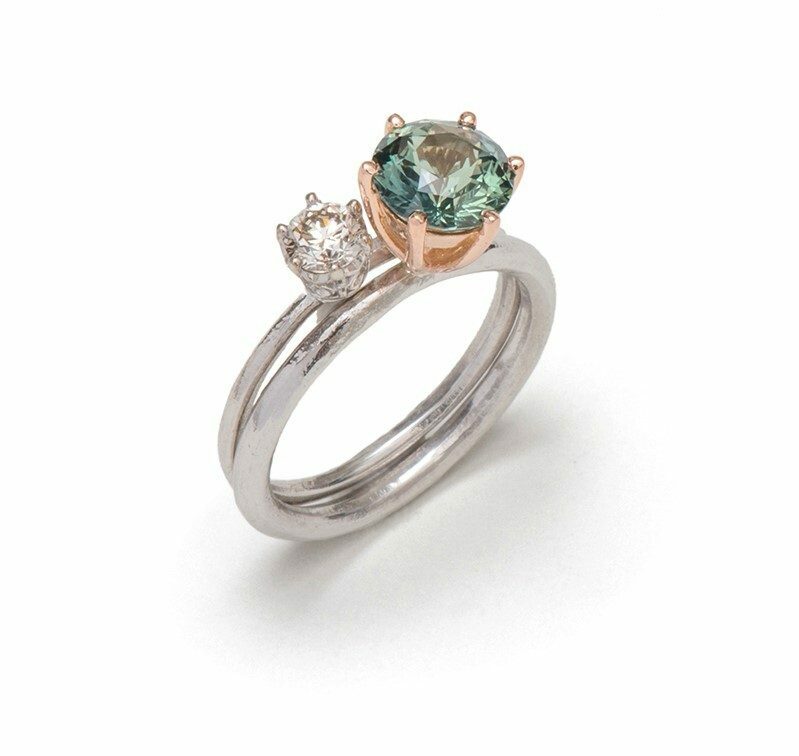 18ct yellow gold, 5.9 mm and 1.9mm diamonds, 0.685ct diamonds. 1.5mm band, 4mm high settings. 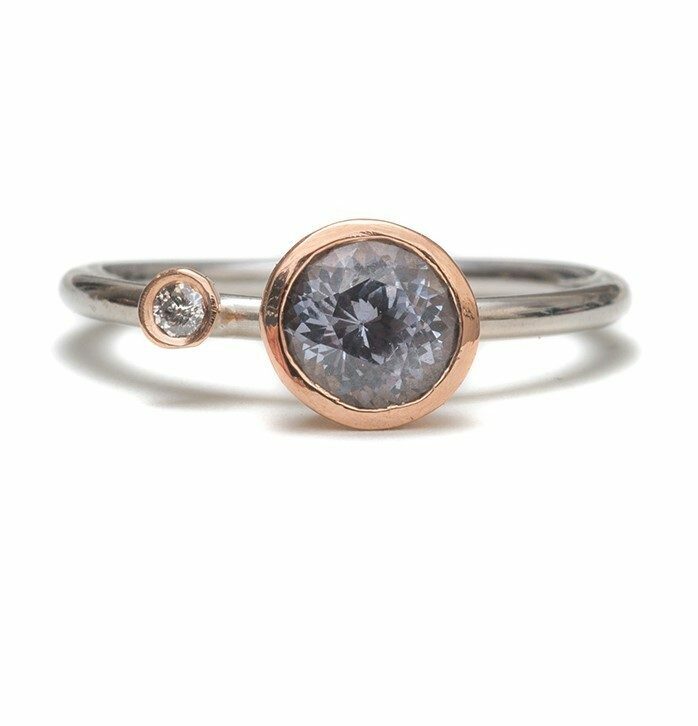 This beautiful ring, created from textured and hand formed 18ct white and rose gold, has a lovely collect set grey spinel, and small round brilliant cut diamond. 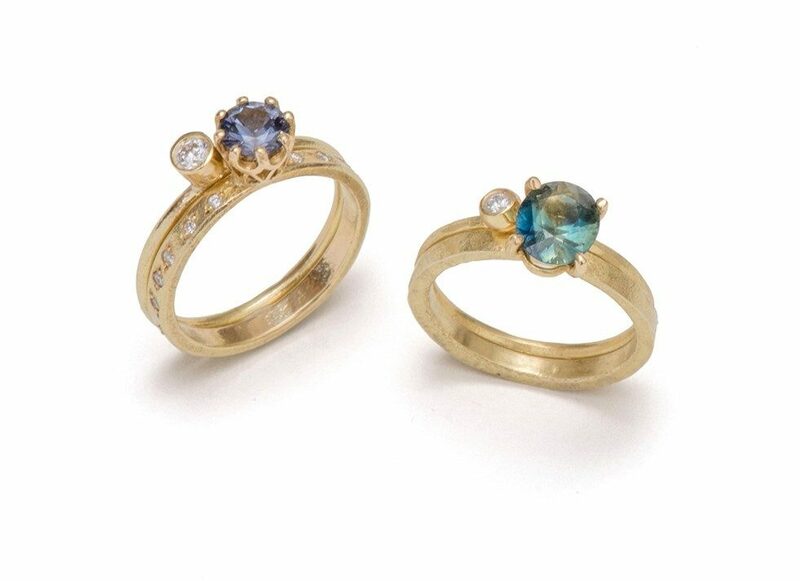 18ct yellow gold, 5.75 mm parti sapphire and 0.025ct diamond. 1.5mm band, 4mm high settings. 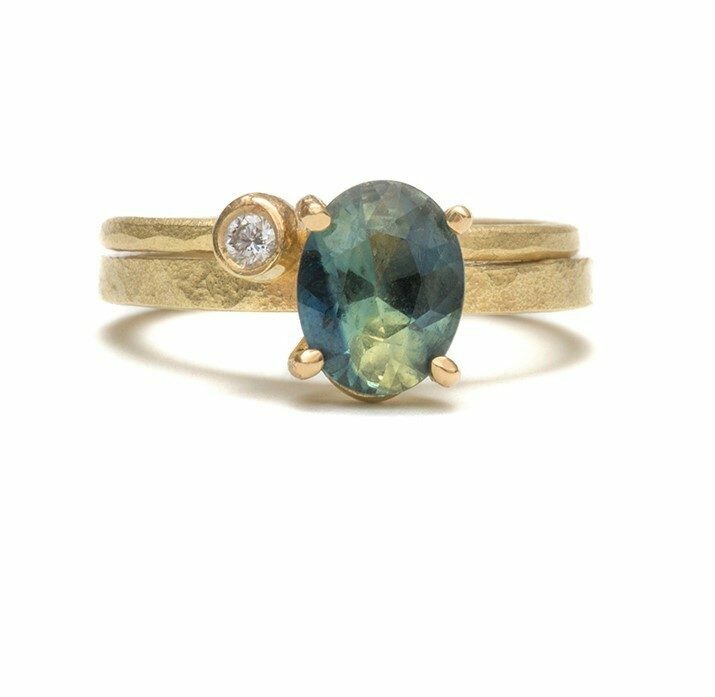 This beautiful ring, created from textured and hand formed 18ct yellow gold, has a lovely collect set parti sapphire, and small round brilliant cut diamond. 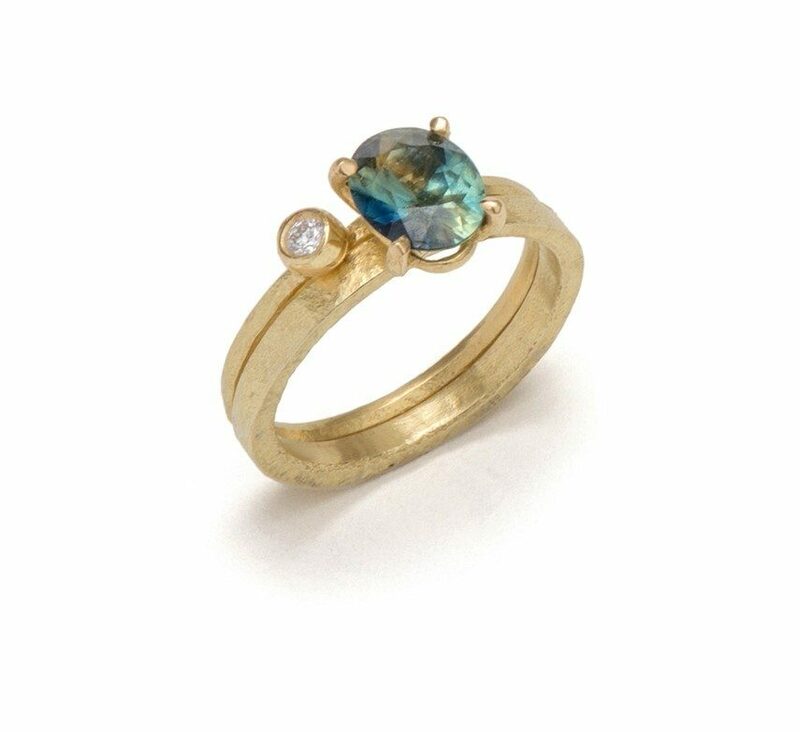 18ct yellow gold, 6.1 mm parti sapphire and 0.015ct diamond. 1.5mm band, 4mm high settings. 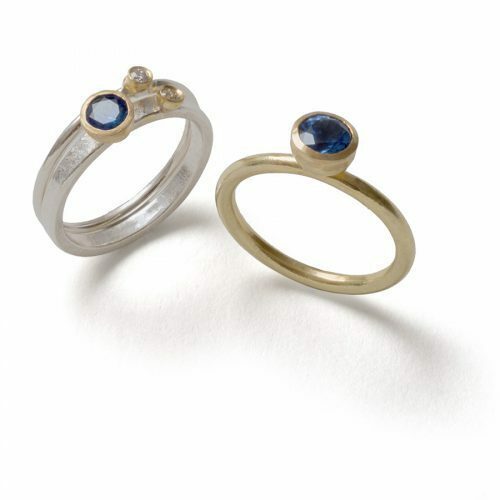 This beautiful set, created from textured and hand formed 18ct yellow gold, has a lovely claw set oval parti sapphire, and a collet set small round brilliant cut diamond. 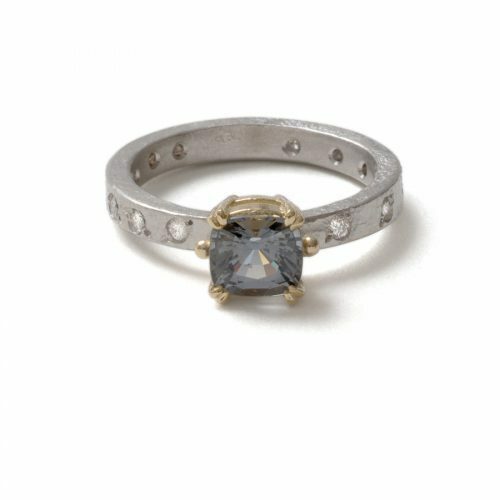 18ct yellow gold, 7.7 x.6mmparti sapphire and 0.05ct diamond. 2mm and 1.5mm bands, 4mm high settings. 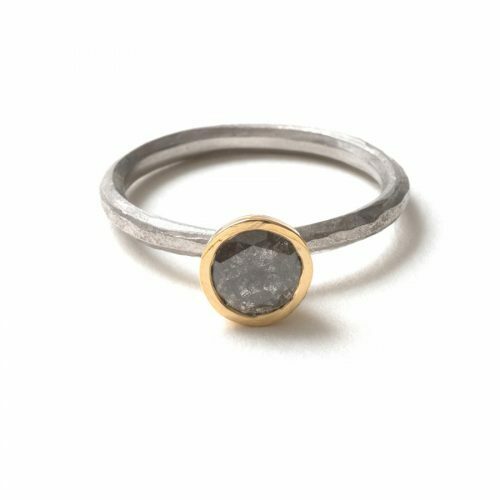 Created from textured and hand formed 18ct gold white and yellow gold, this stunning ring has a rich warm grey cushion cut spinel, set in soft 18ct yellow gold that contrasts beautifully with the sparkly diamond set 18ct white gold band. 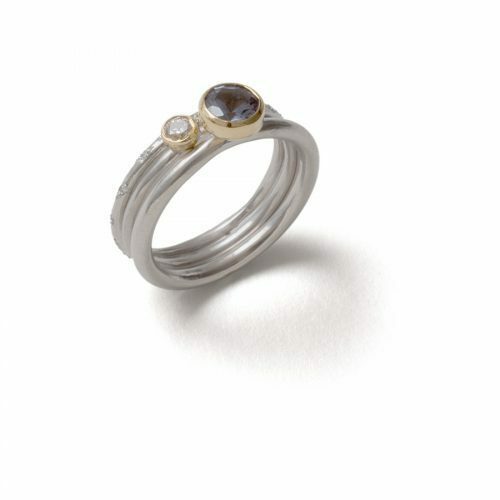 18ct gold white and yellow gold, 6.1 x 5.6mm grey spinel and 0.2ct diamond. 2.5mm 18ct white gold band, 6mm high setting. 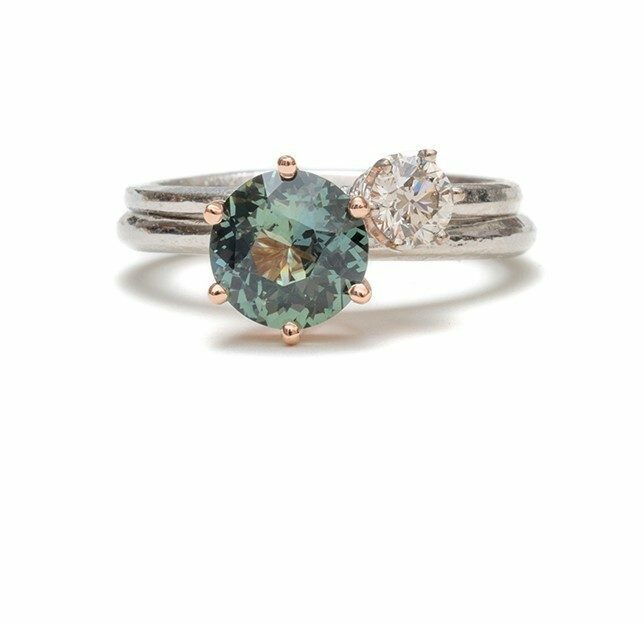 This beautiful set, created from textured and hand formed 18ct yellow gold, has a lovely claw set oval blue green tourmaline, and a collet set small round brilliant cut diamond. 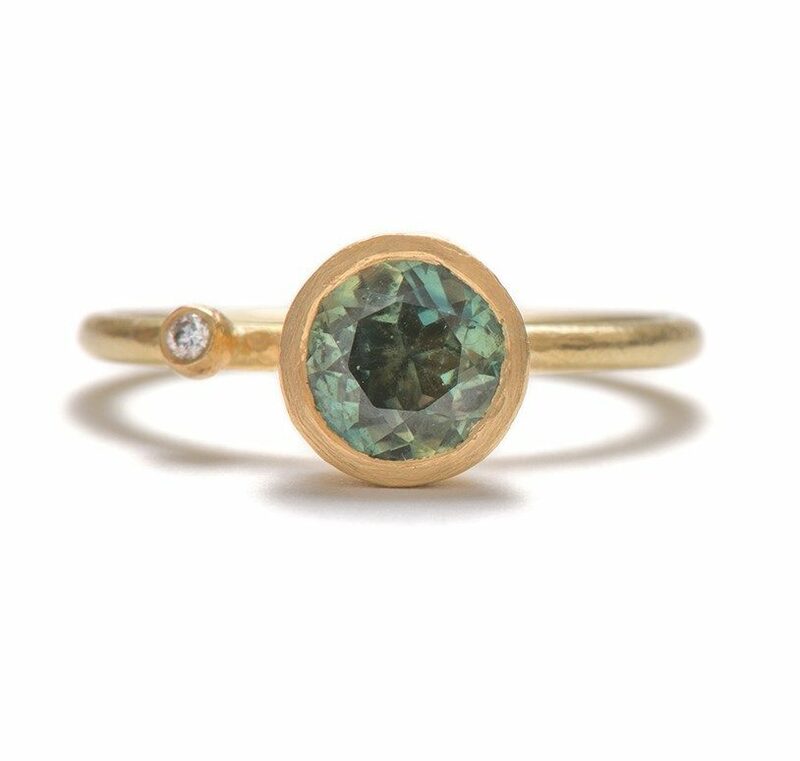 18ct yellow gold, 7.5 x.5mm blue green tourmaline and 0.025ct diamond. 2mm and 1.5mm bands, 4mm high settings. 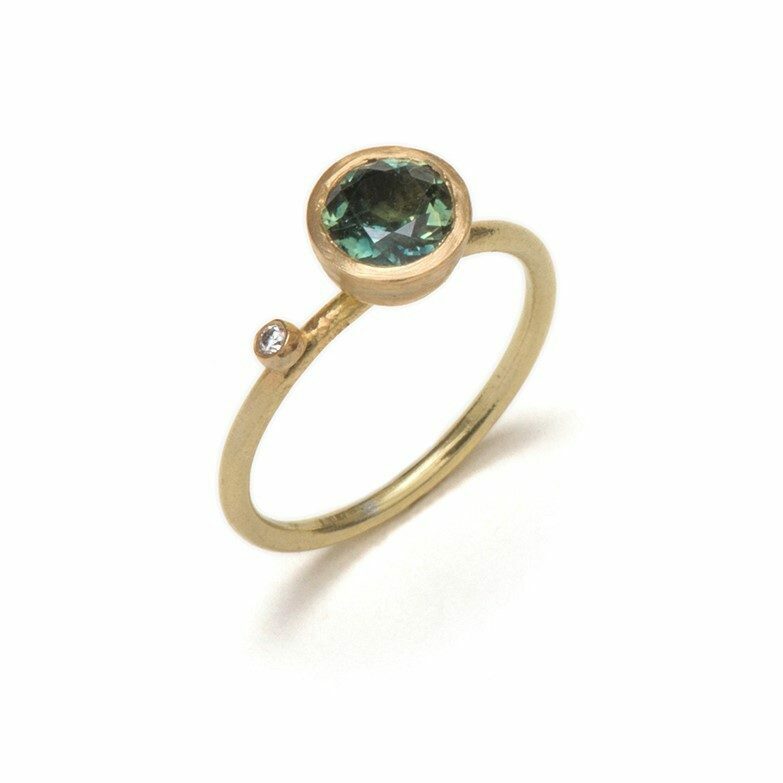 This beautiful ring, created from textured and hand formed 18ct yellow gold, has a lovely collet set oval green tourmaline, and a small round brilliant cut diamond set on to the side. 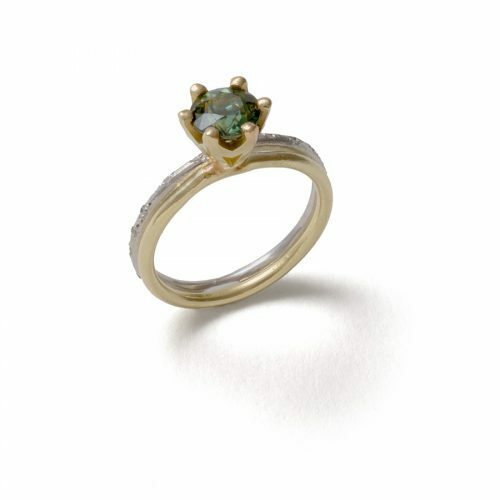 18ct yellow gold, 8mm x 5.5mm green tourmaline, 0.98ct with 2.4mm, 0.05ct diamond. 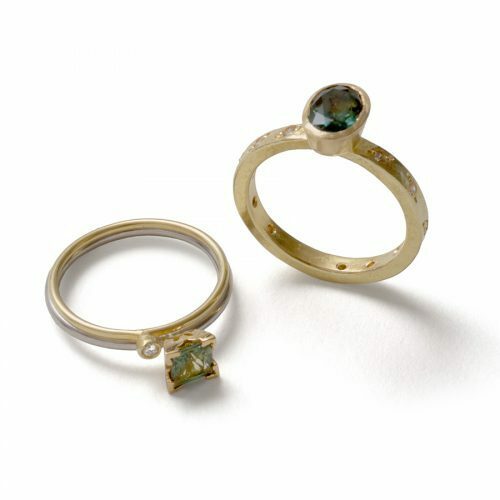 2.5mm gold band, 5mm high setting. 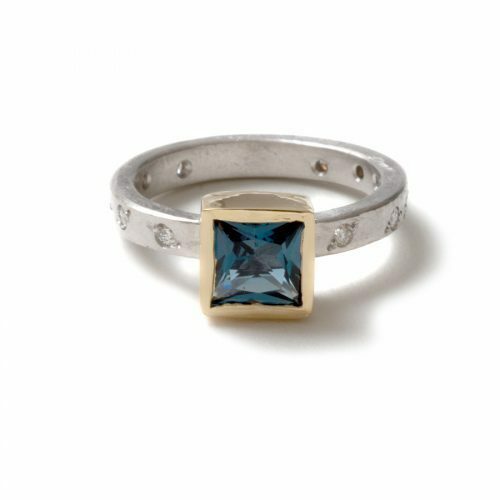 Created from textured and hand formed 18ct gold white and yellow gold, this is a real statement ring, a big princess cut London blue topaz, the dark blue contrasts beautifully with the warm 18ct yellow gold setting and the 18ct white gold band with 11 round brilliant cut scattered diamonds. 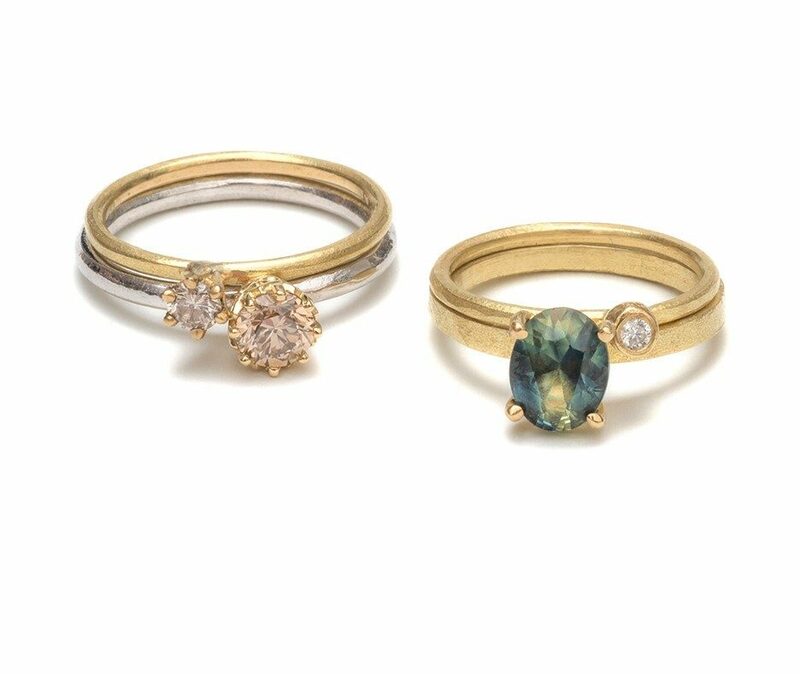 18ct gold white and yellow gold, 6mm london blue topaz and 0.13ct diamond. 2.5mm 18ct white gold band 5mm high setting. This beautiful set, created from textured and hand formed 18ct yellow gold, has a lovely collet set oval parti sapphire with 11 small round brilliant cut diamonds scattered around the band to add some sparkle. 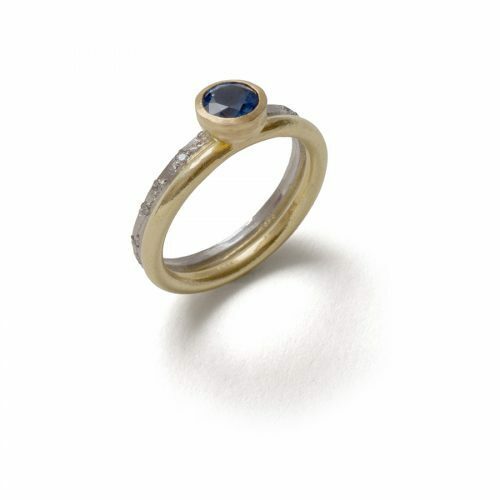 18ct yellow gold, 7.5mm x 5mm parti sapphire, 1.44ct with 0.13ct diamond. 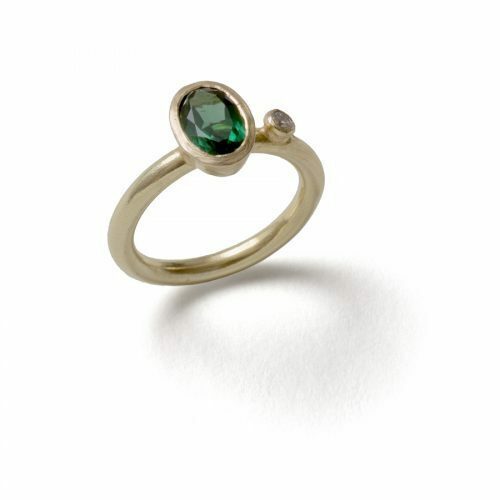 2.5mm gold band, 5mm high setting. 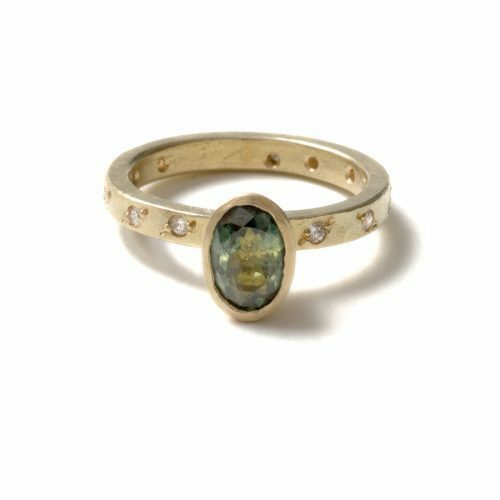 This ring has the style of a traditional engagement ring, created from textured and hand formed 18ct yellow gold, with a beautiful bright claw set round parti sapphire, the use of witch, gives it a lovely twist. 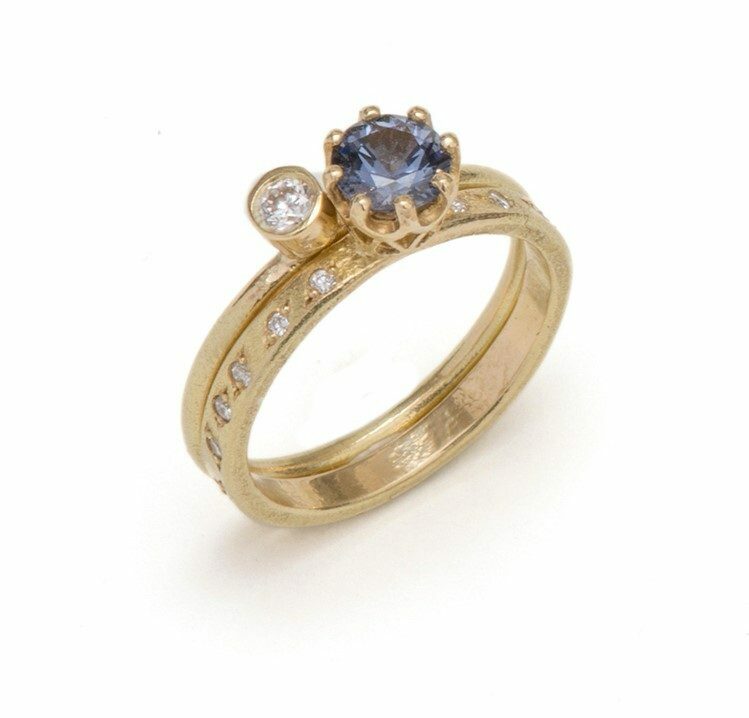 18ct yellow gold, 6.1mm parti sapphire, 1.11ct. 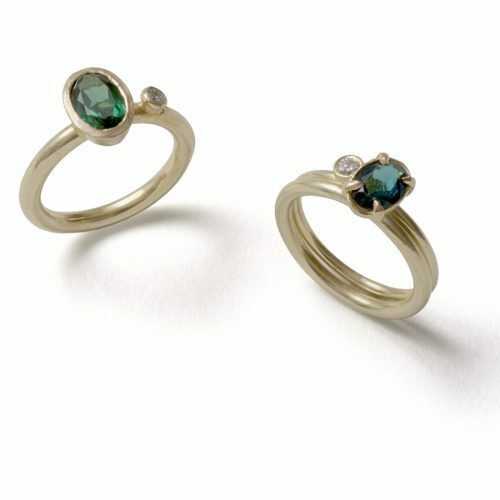 1.5mm 18ct gold band 6mm high settings. 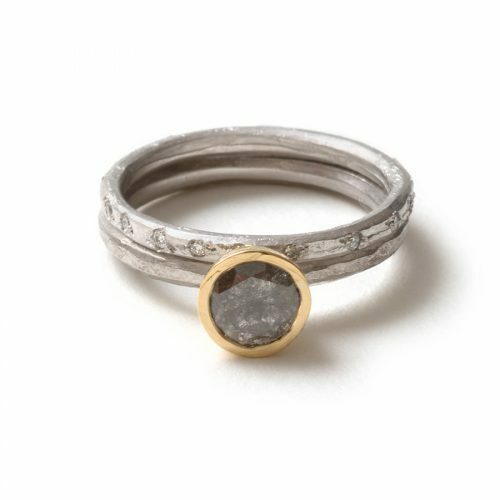 This beautiful ring, created from textured and hand formed 18ct yellow gold. 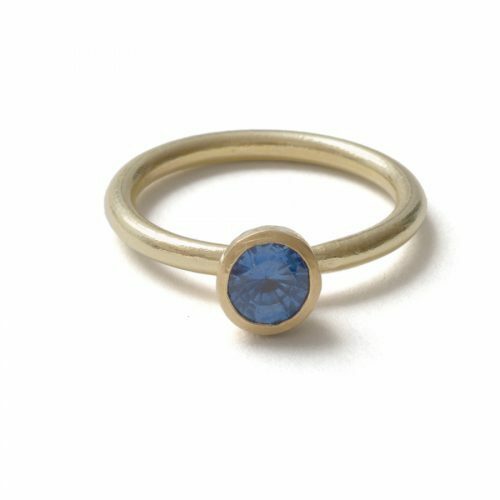 A brilliant blue Ceylon sapphire, collet set in rich 18ct yellow gold, which brings out the amazing colour of this stone. 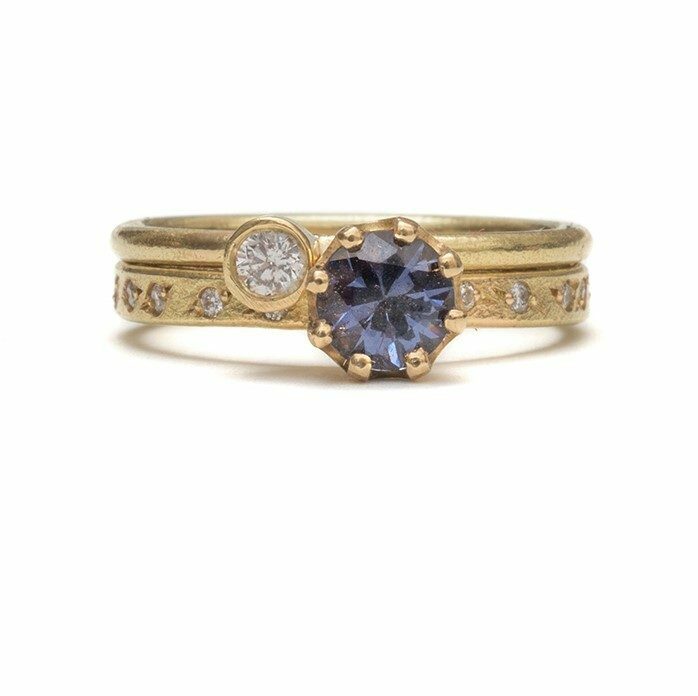 18ct yellow gold, 5.5mm mid bright blue cylon sapphire, .84ct. 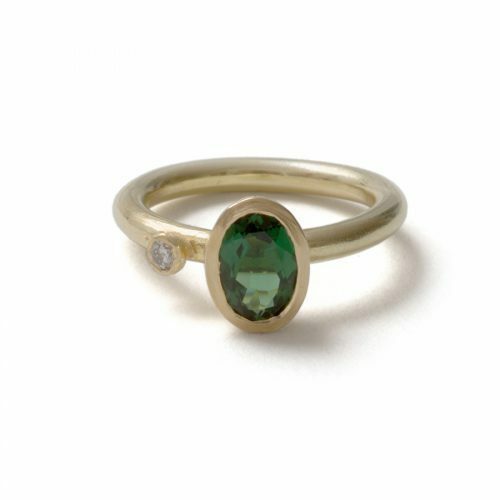 2mm 18ct gold band, 6mm setting. 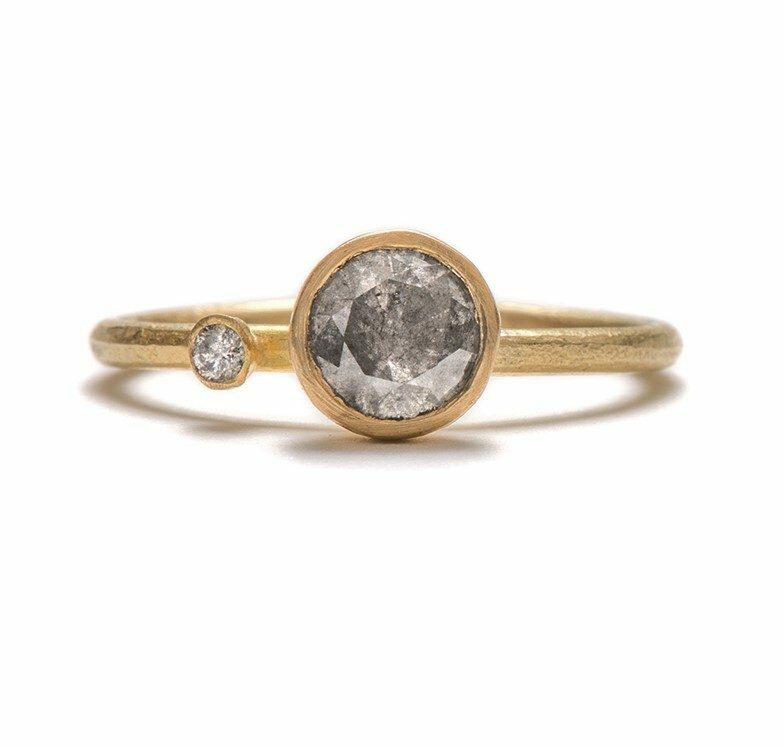 This beautiful set, created from textured and hand formed 18ct white gold, consists of a stunning round brilliant cut salt and pepper diamond, set in a warm yellow gold collet setting, with 14 round brilliant cut diamonds scattered around the band to add sparkle. 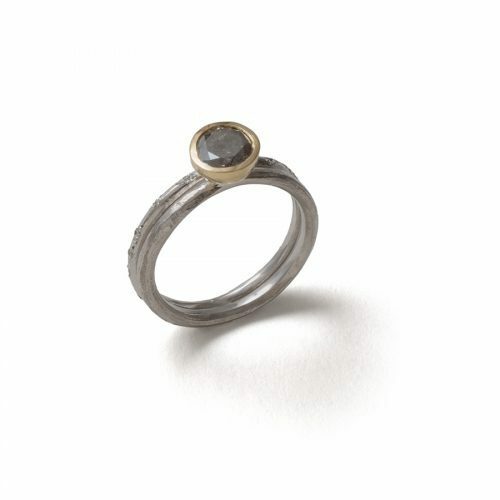 18ct gold white and yellow gold, 5.57mm salt and pepper diamond, 0.73ct, 14 1.4mm diamonds, 0.16ct. 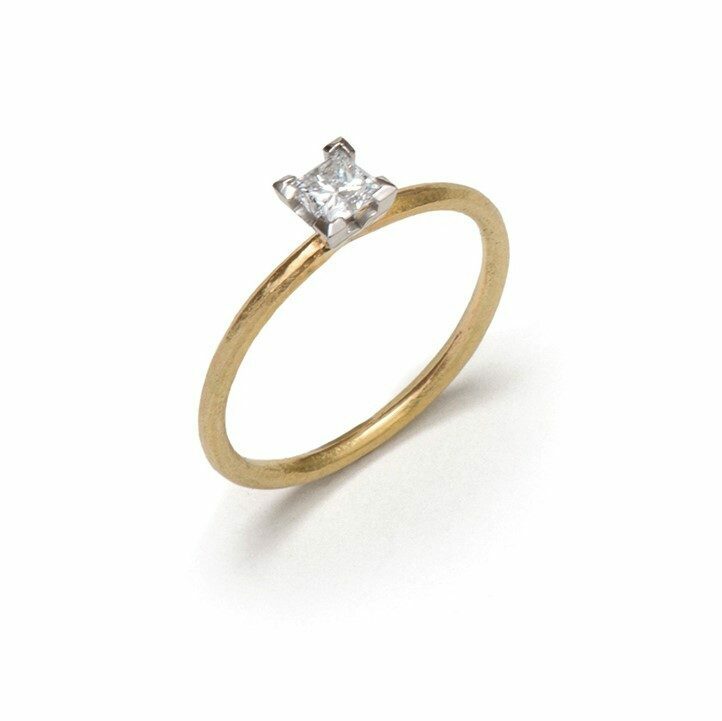 2mm 18ct gold band, 6.5mm setting.